Inspired by the sights and legends of the medieval period, the Ornate Medieval Dagger is made from stainless steel. This dagger has an engraved faux ivory handle decorated with a cast metal guard with a scroll design and knight helm pommel. 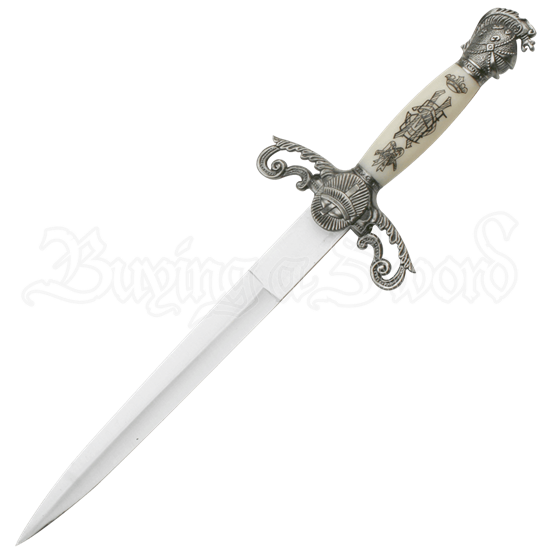 The Ornate Medieval Dagger also comes with a wooden scabbard with cast metal designs on each end, one a scroll and geometrical design and the other of lions and the rising sun. For a truly ornate showpiece, pick up the Ornate Medieval Dagger.